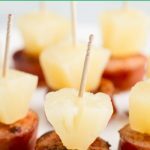 Sausage and Pineapple Bites - Quick and Easy Appetizer! 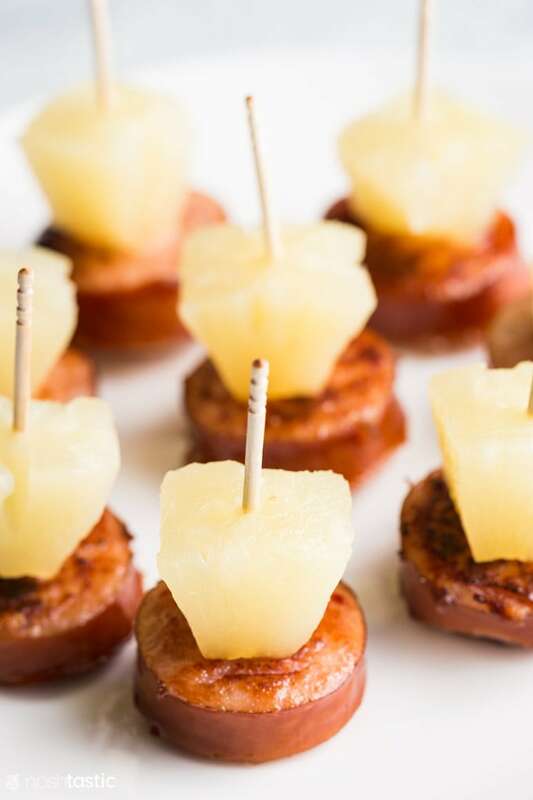 Easy and fun, these little Sausage and Pineapple Bites are quick to make to make and a perfect to put on the table at your next party! This is such a simple recipe but tastes delish! 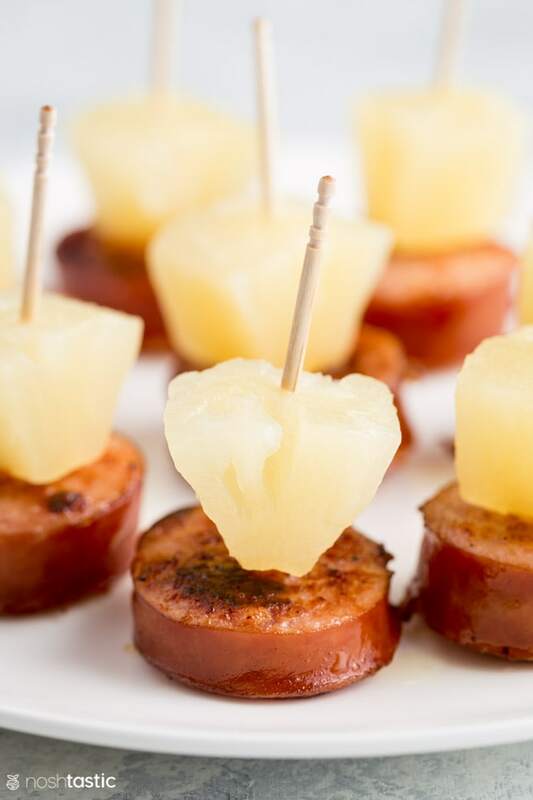 With only two ingredients, my Sausage and Pineapple Appetizer bites are the easiest party food ever! The secret to this easy two ingredient appetizer is to take your time frying the sausage pieces on both sides. What we are going for is to get that deliciously tasty caramelized surface on both sides of the sausage slices, this will make a massive difference to the way it tastes so don’t skip this step! I should say, you need to use an already cooked sausage for these. We used a gluten free kielbasa and it worked perfectly. Once you have all your sausage pieces browned simply thread them onto toothpicks or cocktail sticks with a small piece of pineapple. Canned pineapple that’s already cut into squares is just perfect for this. More party food appetizer recipes! 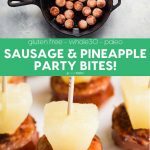 These fun little Sausage and Pineapple Appetizer Bites are easy to make in a hurry and would make a great appetizer for your next party! Cut the sausage into generous inch sized slices and gently fry in a little oil on both sides until brown. Place the cooked pieces of kielbasa onto some kitchen paper towels to absorb excess fat. 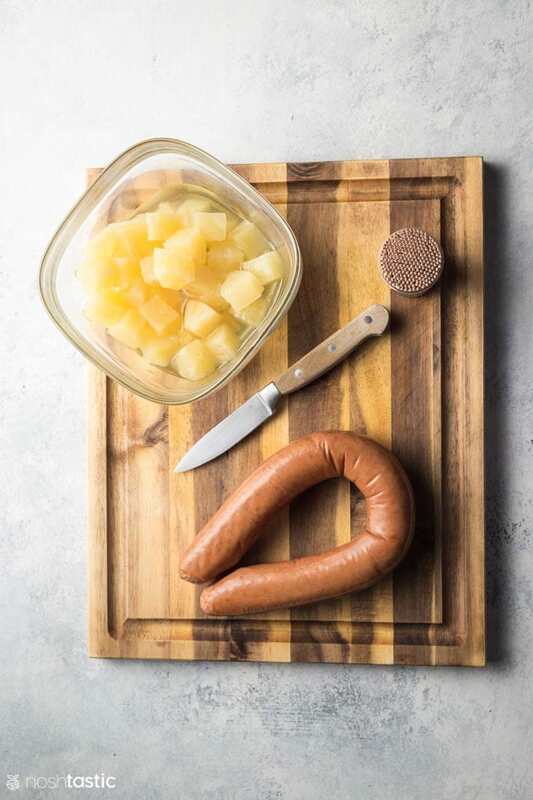 If using fresh, cut your pineapple chunks into inch sized pieces and place one piece each of pineapple on top of one piece each of sausage and stick it with a toothpick. Can be made ahead, store in the fridge. 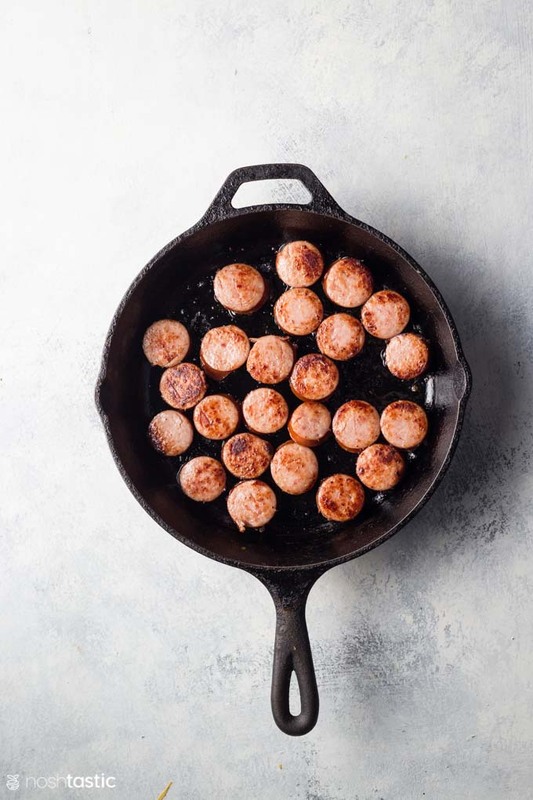 Kielbasa - there are lots of options these days for gluten free keilbasa, just make sure you choose one that's fully cooked already. Pineapple - you can use canned or fresh. If you use canned you can use the rings and cut them or choose the ones that are cut into chunks already. Serving Size - is one piece of sausage and pineapple. Nutrition calculated based on making 20 pieces. Love savoury little bites like these sausage and pineapple skewers. They look awesome! since I wanted them to get to room temperature before we ate them. It worked. I got a positive comment so I guess I will be trying this again. Thanks for the idea. Cute looking, simple and a perfect one bite item. Thanks Sandee! I’m so glad you tried them and it sounds like a really tasty version with the sweet spicey sausage, I’ll need to try them with those! Why do you offer recipe but never gveit?.?? Hi Joni, the recipe is there at the end of the post, if you are reading on mobile you need the click the ‘READ THE POST” button to see it. Hi Sheena! Can I use canned pineapple chunks? Hi Maria, you sure can! I would maybe buy the rings and cut them up, I think the ‘tidbits’ will be too small. Will do, thank you. These will be at my Christmas Eve party! And a Merry Christmas to you too Maria!! Why would I buy pineapple rings and cut them up instead of just using canned pineapple chunks? Just curious. Thanks! Getting ready to try these out. I made a less convenient, somewhat different but equally delightful version of these. I used 3/8 inch (about 8mm) slices of Polska Kielbasa, placed them on a cookie sheet and gave them a slight brown under the broiler. Then I cut fresh, ripe pineapple into pieces a quarter inch (about 6mm) thick and sized for the kielbasa rounds. Placing the pineapple pieces on the kielbasa, I returned the tray to the broiler until the pineapple begins to “tan” at the edges. The heat makes the pineapple very sweet and juicy. Great recipe, thanks!